A unique spin on high-intensity interval training, LES MILLS SPRINT uses the power of pedaling to push your cardiovascular fitness and calorie burn to new heights. WHAT IS HIGH-INTENSITY INTERVAL CYCLE TRAINING? High-intensity interval training (HIIT) is all about going as hard as you possible can for a short time, resting, and then doing it again. The intense bursts of effort followed by periods of recovery enable you to keep reaching your maximum training zone, which is where the results kick in. Featuring scientifically-structured intervals of sprinting, power training and strength building, LES MILLS SPRINT provides the repeated challenge that drives change. As the powerful music plays, your instructor will motivate you to adjust the tension and pace, so your heart rate hits specific training zones at all the right times. You’ll unleash fast-twitch muscle fibers and grow lean muscle tissue, which is key to burning fat. HIIT is commonly associated with weight-bearing exercises like burpees, lunges and tuck jumps, which can be problematic if you suffer foot, knee or lower back pain. 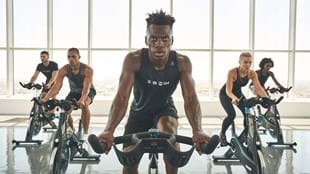 The low-impact nature of cycling makes LES MILLS SPRINT a brilliant HIIT alternative – if you have orthopaedic restrictions you can repeatedly push your heart rate to max training zone without any risk of injury. WHY SHOULD YOU DO LES MILLS SPRINT? If you’re looking to take your fitness to the next level LES MILLS SPRINT will make it happen. There are no complex moves to master and you manage your own resistance, so it’s a great workout for anyone who is new to HIIT. And because it’s low-impact it’s a particularly good option for anyone suffering injury. HOW MANY CALORIES DO YOU BURN DOING LES MILLS SPRINT? It’s not called a calorie killer for nothing. In a 30-minute LES MILLS SPRINT workout out you can expect to burn around 450 calories* – and the calorie burn continues long after the workout wraps up. 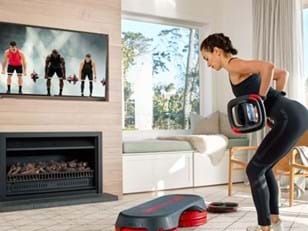 LES MILLS SPRINT stimulates excess post-exercise oxygen consumption (EPOC) which means, depending on how hard you pedal, you will continue burning calories for up to nine hours after your workout ends. WHAT EXACTLY DO YOU DO DURING LES MILLS SPRINT? Prepare for periods of powerful pedaling followed by complete “catch your breath” rest. The focus mixes between sprinting, power training and strength building. Sprinting is where the tension is light but it’s heavy enough that you don’t bounce in your seat. Power training is when you pedal fast but with a tension that is challenging. And strength training is when the tension is so heavy that it slows your legs and eventually you need to stand. DOES LES MILLS SPRINT REALLY GET RESULTS? A recent study shows that LES MILLS SPRINT can significantly improve cardiovascular, metabolic and musculoskeletal fitness. Study participants reduced body fat mass and blood pressure, while they enhanced their cardiovascular fitness, lean body mass, glucose tolerance and strength. Other studies show that the HIIT formula drives the greatest activation of muscle and fat-burning capacity, and research highlights HIIT’s EPOC effect, which means your body continues to use oxygen and burn fat long after you’ve stopped exercising. HOW OFTEN SHOULD YOU DO LES MILLS SPRINT? It’s a good idea to do LES MILLS SPRINT no more than twice a week. New research reveals optimal results come when you limit the time you spend with your heart rate above 90 percent maximum to 30-40 minutes per week (which equates to two LES MILLS SPRINT workouts). While it’s ideal to have some base fitness, you don’t need to be super fit. There are no complex moves to master and you can adjust the resistance to suit. Your instructor will help push you to your max, but it’s okay if you need stop and catch your breath – as that indicates you’ve been pushing your body to the max training zone. WHAT DO YOU NEED FOR A LES MILLS SPRINT WORKOUT? An indoor cycle is all you need. You don’t require any special clothing or shoes, but if you want to make the ride more comfortable opting for cycle shorts and specialized cycle shoes can be a smart move. CAN YOU DO LES MILLS SPRINT WHILE PREGNANT? This is not a good idea, as pregnancy is not the time to be pushing your body to its limits. HOW DO YOU BECOME A LES MILLS SPRINT INSTRUCTOR? The first step to becoming a LES MILLS SPRINT Instructor is to connect with a club or your local Les Mills team. We’ll then provide you with plenty of training, you’ll get assessed, and then you’ll be ready to lead your own workouts. You can find out exactly what it takes to become a LES MILLS SPRINT Instructor here. WHERE CAN YOU DO LES MILLS SPRINT? You can find a LES MILLS SPRINT workout near you here. 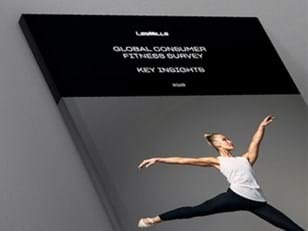 Alternatively, check out LES MILLS On Demand and do LES MILLS SPRINT anytime, anywhere. *Actual energy expenditure varies depending on your age, your weight, your gender and the intensity of your exercise efforts.